After many lean seasons in the Super 14, the Newlands faithful have eventually got something to cheer about. The Stormers emphatic 42 -14 win over the Crusaders proved that they have the character to go all the way in the 2010 Super 14. The Crusaders came at the Stormers and an early Dan Carter charge down and try could have swung the game right at the beginning into the Crusaders favour. However, Schalk Burger who is growing in stature as the captain of the Stormers kept the troops calm and let from the front ably assisted by the ever improving Duane Vermeulen and the Andries Bekker who is developing into a world class lock forward. Bekker has been instrumental in bringing the winning culture that is developing in Cape Town. He has found his feet in international rugby and is starting to impose himself in the big games. 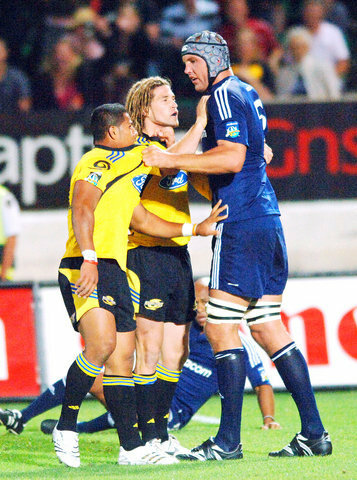 As Mark Andrews the legendary Springbok enforcer and World Cup winning lock forward noted, the first few seasons of big rugby are difficult as Bekker would have been tested by the big men like Bakkies Botha. Bekker has shown that he is now ready to take his rightful place in world rugby and outclassed All Black’s Chris Jack who is back in the Crusaders team as well as Brad Thorne. Every great team has its enforcer and Bekker has taken up that mantle in the Stormers team. Mark Andrews, Adri Geldenhuys, Moaner Van Heerden, Kevin De Klerk and Bakkies Botha have all played major contributions to the Springbok’s successes over the decades and eventually Cape Town has bred a lock that fits into the mould. Going into the build up to the 2011 Rugby World Cup in New Zealand and South Africa is looking good up front. The old firm of Victor Matfield and Bakkies Botha will still be around barring injury and Matfield will be hard pressed to stay ahead of the man from Cape Town as the number one lock in the country. With Erasmus as Director of coaching and Coetzee the head coach, these two men have formed a great combination that is paying off on the field. Rassie was given the cheque book and brought Brian Habana and Jacques Fourie into the fold. These two world class players have fitted right into the brand of rugby that the Stormers want to play. Coetzee learnt invaluable lessons as Jake White’s understudy and a happy culture exists amongst the players. The incredible Schalk is a machine who is relishing the role of captaining the side. Immensely popular and respected by his team mates and has been instrumentally in ensuring the players are playing for the jersey and for each other. Nobody can rattle Schalk and the Stormers have been a composed team this year that have handled the big pressure moments well. Bekker has dominated the line out, cleared out well in the rucks, had galloping runs on the wing that opponents have found difficult to stop and has added “grunt” to the tight five. He is now a world class player in his own right. He has moved up in the pecking order of number 8’s in South Africa and must be breathing down the neck of Pierre Spies. His cross defense against the Crusaders was sublime and his dismissive tackles of two Crusaders attackers just meters from the Stormers try line proved just how strong Vermeulen is and how dedicated he is to the cause. It is difficult to highlight certain players when the back line is operating as a unit and everyone is playing their part. Peter Grant is getting the line moving and the experienced Jacques Fourie is a colossus in midfield. Bryan Habana is probably under rated in terms of defense, while Gio Aplon continues to surprise everybody with his calmness under the high ball and the gaps that he just seems to glide through. The Stormers boast the best defensive record in the competition and the Crudasers discovered this to their chagrin at Newlands. Can the Stormers eventually go all the way and win the Super 14? Schalk Burger has cautioned the players not to get ahead of themselves but was pleased with the intensity with which the Stormers overcame the Crusaders. The big hurdle will be the Bulls at Newlands in two weeks time. The winner of that game may well end up being crowned as the 2010 Super 14 Champions.